State’s attorney candidate Thiru Vignarajah launched a frontal attack on opponent Ivan Bates yesterday, calling Bates’ claim that he never lost a murder case “inflated” and presenting data purporting to show that Bates never won a murder case either. Bates responded that he had successfully prosecuted more than a dozen homicides during his six years as an assistant state’s attorney, including “four or five adult” murder cases. After producing documentation for several of these cases, the Bates camp last night presented a retired Baltimore police detective, who recalled his work on one of the cases. “We met for weeks preparing for the trial – he did an excellent job,” said Kevin Turner, speaking of Bates’ effort to secure the conviction of Wesley Whiting, also known as Lynelle Whiting. The East Baltimore man was convicted of the killing of correctional officer William Jerome Moore Jr. in 2001 and is serving a sentence of life plus 25 years. Court documents reviewed by The Brew show Bates and Stephanie Royster as the prosecutors of record in the case. Bates said the attack represented 11th hour desperation on the part of his opponents. 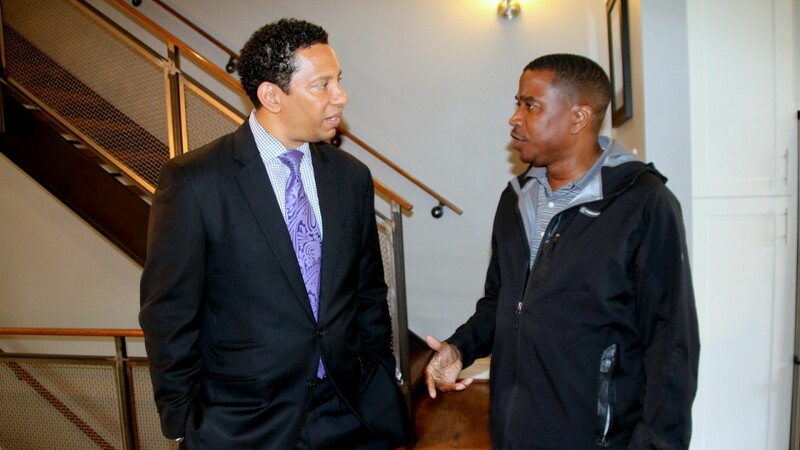 “This press release from them shows either Mr. Vignarajah doesn’t know how to search court records or he is being deliberately misleading,” said Bates, speaking along with Turner, at a Fells Point meet-and-greet event. Vignarajah’s charts use information gleaned from Judiciary Case Search, the Maryland court system’s online database, but do not appear to reflect a review of the actual case files that contain more complete information. A spokesperson for Vignarajah has not yet responded to a request for comment from The Brew. With two weeks to go until the primary (which will determine the next state’s attorney because there are no Republican candidates in the general election), the attack was the latest exchange in the high-stakes battle for top prosecutor in a city plagued by crime, violence and dismal police-community relations. Candidates for Baltimore state’s attorney from left Ivan Bates, Marilyn Mosby and Thiru Vignarajah. Strikingly, the incumbent in the three-way race joined Vignarjah in his attack on Bates. Soon after news of the allegation dropped on Twitter, Mosby and several supporters, including her husband, Del. Nick Mosby, “liked” it. Bates said the coordinated criticism indicates that Vignarajah, a former federal prosecutor whose name was not widely known to voters, is working to help Mosby win election to a second term. “It’s sad that the other candidates are working together to prevent the citizens from having a truly experienced state’s attorney,” he said. Mosby’s organization also has not returned a call from The Brew. State campaign finance records show some odd spending patterns in the race, most noticeably that Vignarajah has expended so few dollars on his campaign. As The Brew has previously reported, Vignarajah reported $10,000 spent on campaign material, $7,700 on billboards and nothing on media buys for the period of January-April. Since announcing his run for state’s attorney last September, Vignarajah has forked out just $34,163. That’s $1 in expenses for every $8.24 he says he has raised (including a $250,000 personal loan he says he made to his campaign in January). In contrast, Mosby so far has spent $192,679 on her re-election bid, or $1 for every $2.40 raised, while Bates has spent $263,836, or $1 for every $2.32 raised. The three candidates have criticized each others’ records throughout the campaign – though, again noticeably, neither Vignarajah nor Mosby at this stage of the campaign are attacking each other as vigorously as they are Bates. Vignarajah’s press release yesterday, however, questioned Mosby’s accomplishments, noting for instance that she won only 102 trial convictions of nearly 2,600 gun-related indictments from 2015 to mid-2017. Mosby has said her office has performed well despite frequent turnover in the leadership of the city police department, corruption among its officers and the unrest following the 2015 death of Freddie Gray. Responding to a Wall Street Journal article citing a drop in the felony conviction rate after she took office, Mosby blamed the quality of police cases and said conviction rate is not the best way to judge a prosecutor. On the subject of dropped cases, Bates acknowledged that he did drop two murder cases upon learning that the defendant was not the shooter. He said he doesn’t consider those dropped cases to be “losses,” saying “we were going after trigger pullers.” In other instances, he said, cases that showed up as “dropped” by him were one that had been brought by other prosecutors. Vignarajah said Bates’ dropped cases contradict his “undefeated” claim. Bates’ defenders, meanwhile, were online today critiquing Vignarajah’s record and posting links to stories about his high-profile city prosecution leading to the arrest of 48 alleged Black Guerilla Family members in 2013. Of those charged, 13 went free “with a jury finding the reported leader of the gang not guilty of all charges, the Sun reported. Of those convicted, only three received a sentence of more than five years, the paper reported. Vignarjah did not respond to a request from The Brew to provide data to measure his effectiveness as a city and later federal prosecutor.